A beautiful two color African hardwood for aquariums. In aquariums, sinks immediately, no weighting down required. Smooth surface, textured detail, and unique mottled color adds interest and enrichment to habitats. Use with plants to create the "naturalistic" look. One of the hardest and densest woods available; sinks immediately in aquariums and unlike driftwood, will not rot! 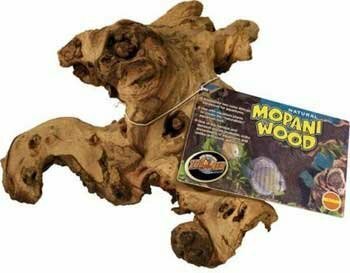 Additional Information: Mopani Wood has been sandblasted clean and is ready to be added to your terrarium. For use in aquariums, remember all natural wood leaches tannins, which discolor water and reduce pH levels. To minimize this effect, soak wood in a separate container, and change water daily to remove excess tannins. The wood will be ready when the water color goes from dark brown to a very light. Adding extra carbon to your aquarium filter can help remove any remaining discoloration. "Aquarium Tag" indicates that this item is sold in aquarium stores and is specifically for aquariums.